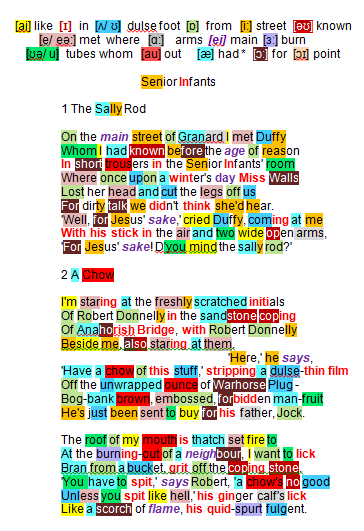 A short sequence in poetry and prose recalling characters from Primary schooldays (before the age of reason) … a poet and his contemporaries, once infants now of senior age, and the different life-styles they were exposed to. Heaney bumps into a Primary school class-mate in the street, larger than life, grown senior, jovial, affectionate. A particular memory floods back, exaggerated by time – of physical punishment suffered once upon a winter’s day (a reworked standard fairy-tale opening ‘Once upon a time…’ from the lost domain of childhood). A primary school teacher Miss Walls, out of control (lost her head) administering frenzied physical punishment (cut the legs off us) in retribution for no more than a laddish ‘crime’ (dirty talk we didn’t think she’d hear). The reunion of the two men grown elderly is warm: Duffy with his stick in the air and two wide open arms. What is etched on his memory and recounted with some pride is the willow stick with which the ‘wicked boys’ were beaten: ‘For Jesus’ sake! Do you mind the sally rod? In a different place Heaney recalls a different youngster with a different approach to life. He gives in to an ‘illicit’ temptation and suffers the consequences. Memory is prompted by scratched initials still evident in the sandstone of Anahorish bridge. Heaney knew them freshly carved by Robert Donnelly. The story is told as if it were happening (beside me). The boy, on an errand for his father, offers him an illicit chew (‘chow’) of tobacco. Heaney clearly remembers the tobacco’s textures (Warhorse Plug – bog-bank brown, embossed) and his ‘sinful’ involvement with forbidden man-fruit. He accepts the ‘dare’ and lives to regret the unbearable heat it generates (the roof of my mouth is thatch set fire to), impossible to alleviate: I want to lick/ Bran from a bucket, grit off the coping stone. The street-wise boy offers the wisdom of experience: ‘a chow’s no good unless you spit like hell’, before demonstrating what he means, first opening the lips (his ginger calf’s lick) to reveal the tobacco-coloured contents of his mouth (a scorch of flame) then ejecting a vivid spit of liquid: his quid-squirt fulgent. The Homepage of Anahorish Preserves claims as follows: “For over 6 generations the Gribbin Family have lived, farmed and produced food in a place called Anahorish. The name is derived from the Irish Anach Fhior Uisce which means Place/Hill of Clear Water or Place/Hill of Excellent Water. Nobel Prize Winning Poet Seamus Heaney () was born on a farm called Mossbawn in the next Townland of Tamniarn. Seamus spent much of his early childhood in Anahorish and he attended Anahorish Primary School”. One Christmas Day in the Morning. The sectarian backgrounds of classmates at primary school were of little interest to Heaney, from a tolerant, catholic household. The resulting ‘innocence’ on that score leads to an unguarded moment that makes him think again. A prose-poem describing how the speaker is suddenly aware that his conversation is too loose, that he should have taken account of the company and known better. It makes for a compelling piece of psychological drama even a screenplay using ‘flashback’ akin to A Constable Calls in North. The sight of Tommy Evans, another schoolboy from the past, recalls an incident that occurred whilst Heaney was having a Christmas Day drink years later in a pub at Castledawson at the height of the Troubles. The build-up: Heaney is feeling elated (free as a bird), a catholic at large in Protestant airspace. Christmas bonhomie prevails and routine banter between people in groups. The first hints of sectarian tensions arise, however, when Heaney reveals in unguarded conversation (blabbing) that he is a Catholic, is wary of guns and did not have parents who gave them to children as Christmas presents. His personal opinions bring about a change of atmosphere and a pivotal moment when Tommy’s eye upon me narrowed. Heaney takes refuge in flash-back memories of playing at Tommy’s house with Tommy toting an airgun with which he drilled the pair of us left-right (‘drill’ can mean both ‘shoot’ and ‘practise marching’)! Other paramilitary hints surface, perhaps unrecognised by Heaney until this moment: a chicken coop in shape of a sentry-box and Tommy’s target, the chrome lid of a bicycle bell. Heaney gulps … boys in Ireland such as Tommy might easily have grown up to engage in paramilitary action – the sound memory of ricocheting pellets in a back-garden acts as a wake-up-call: little zings fairly brought me to my senses. 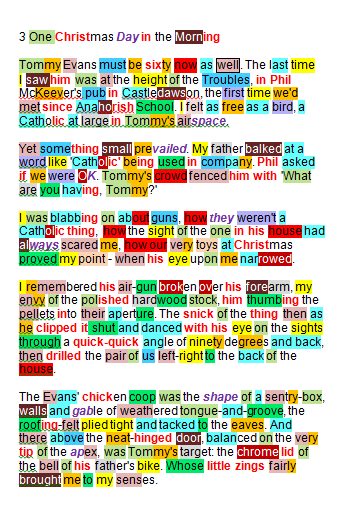 despite his choice of prose, Heaney loses nothing of the poet in himself: deliberate groups of assonant sounds, for example, the [ai] of the first and fourth paragraphs, the [ɪ] sounds of para 4 and clusters of alliterative consonants, for example alveolar plosive [t] in the final para;.